Melvin Burgess – “You’re never too old to plug something in”. 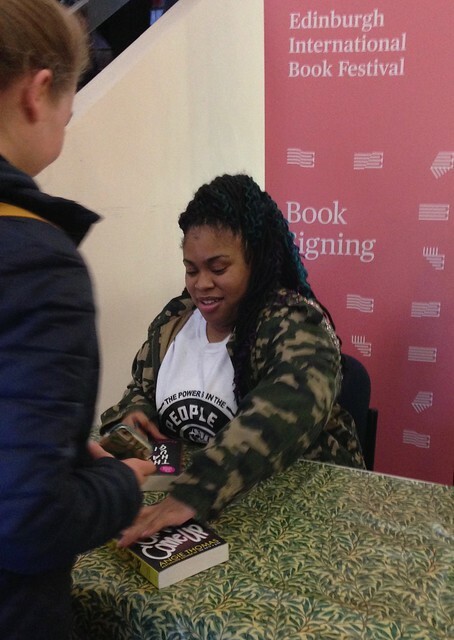 You might have noticed me mentioning Angie Thomas a bit recently. Before Saturday’s event with her, I wanted to read her books, and ended up reading the second one and watching the film of the first book on DVD. I thought this would be efficient use of my time. One problem now is that I liked the film so much that I might need to read the book too. 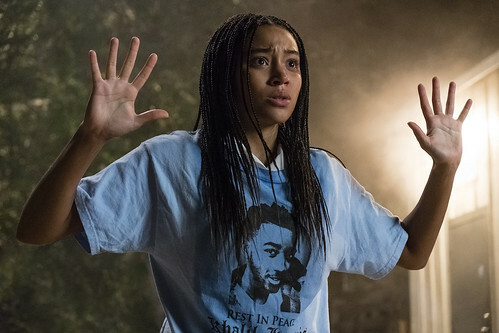 Having read On the Come Up, I felt that The Hate U Give exactly mirrored Angie’s writing. I almost sat there nodding my head in agreement with everything, as though I was reading the book. Knowing how most films are not exactly like the novels they are based on, I should probably treat the film with a little pinch of salt. And then read the book. A refreshingly black film, I was aware that I don’t know much at all. I’ve no experience of the lives the characters lead, and it was often hard to hear what they were saying. But that’s me, not them. Just as fans of the books like the fact that the characters speak like them, that goes for the film as well. The Carter family live in a poor, black neighbourhood, but ambition for their children means that all three are sent to the mostly white school further away. As the main character Starr says, she’s another person when she’s at school. She has to be. And Starr does it so well that none of her friends have an inkling what her real life is like. It’s a bleak situation, handled very well. As Angie said, she needs triumph to balance the trauma, so it’s not all negative. But to stay true to what so many black people face every day, this feels like a hopeless situation. You shouldn’t have to spend every day in fear of what the police will do if they ‘notice’ you. Except this is reality for millions in America. Starr’s family are not perfect, but they work together. Her dad has been in jail, and her mum is another strong mother, just like Bri’s in On the Come Up. There are friends, neighbours, an uncle, even the local crooks. I rather wish they had not made Starr’s white boyfriend* look like a Republican senator-to-be, but other than that this film was pretty perfect. It’s certainly an eye-opener. The question is whether those who need to see it, will. *I understand that the original actor was dropped because he made racist remarks. That proves how necessary books and films like this one are. ‘Do they know it’s not August?’ both Offspring asked. They did. They being the Edinburgh International Book Festival. 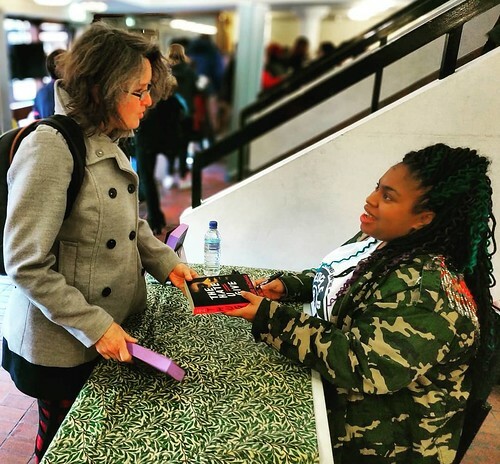 And bless them for having an extra event for us, in the dreary days of March, when it was so cold that I suspect Angie Thomas, whose event this was, wanted nothing more than to get back to Mississippi. ‘I can’t do cold weather,’ she said. Although it appears Scottish shortbread goes some way to pacify her. This event, where Angie spoke to poet Nadine Aisha Jassat, was very popular. People queued outside the Gordon Aikman lecture theatre in George Square before being let in. It was a predominantly female audience, mostly young ones, but a fair few unaccompanied adults too. This is testament to how well known this new American author has become, and how popular she is. I’m guessing most had read both her books, The Hate U Give and On the Come Up. 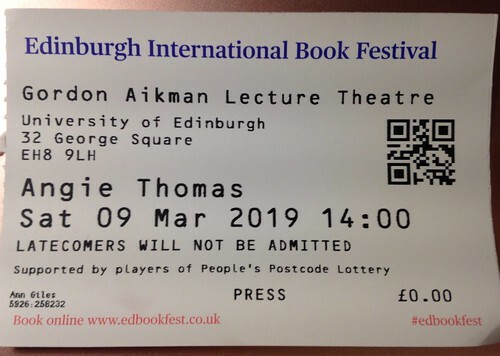 As one [black] fan in the audience pointed out, Edinburgh is not a very black city, or I’m sure there would have been a much larger proportion of black readers present. Angie’s books must be what they have all been waiting for. I would have, if only I’d known. On this, her only Scottish gig, Angie said you should do what you’re scared of. She’s surprised that she’s now making a living lying, which she’d not been expecting when working as a church secretary in Mississippi, occasionally writing her novel at work. Like her two heroines, Starr and Bri, she grew up in a poor black area, going to a white school, having to live two different lives. ‘I respond to things’ is how she describes herself. She changed after a shooting of a young man in California, where everyone concentrated on the fact that he was an ex-con, rather than on the fact that he was lying on the ground and was shot in the back. 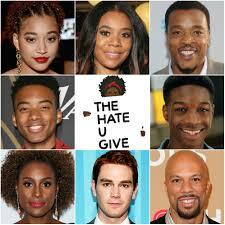 So Angie wrote The Hate U Give to prevent herself from burning down her school in anger. And On the Come Up was written in response to that book. 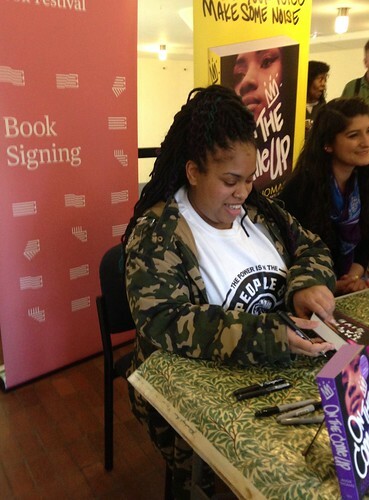 Writing is cathartic, and she has inspired young people to write, which has empowered her. For many of them it has been a revelation to read a novel where ‘they talk like I talk, they sound like me.’ Angie pointed out that although her speech may sound simple, using words like ain’t, she has a GPA of just below 4, which is very high. Angie wants people to remember that Trayvon Martin was a boy whose mother loved him. She also said that contrary to popular belief that black fathers are not part of their children’s lives, there are statistics that prove they are more than average involved. For Angie it’s important to concentrate on the people, not on the issues. She feels that she can’t worry about what others think of her; it’s better to follow her heart. The best way to change the world, is to change the world around you. And with that it was time for questions, and we were all very taken with the flying mic. It’s a soft – red – cube, that was chucked round the auditorium. It was hard not to hold your breath as you watched to see where it would land, and if its intended target was going to miss. First one out was someone I know, and it was one of many really good questions. She has always made up stories, beginning by rewriting Green Eggs and Ham because she didn’t like the ending. At the age of eight she entertained her friends at school with cliffhangers. Her books need both the trauma and the triumph, which answered a question I’d had too. Subjects like fatal shootings don’t generally have much good about them, but Angie has inserted hope into her stories. She loved Harry Potter. Those books ‘saved my life!’ And we could see that in The Hate U Give; it’s almost incongruous to have the famous wizard in a story about crime against black people in America. But it gives it recognisable reality (I know. They are books about magic), something nearly all of us know. Asked about her books being banned, Angie said that ‘the banned book list is a great list’ to be on. Americans always want to read more of banned books. We could easily have done another hour. As it was, Angie had a plane to catch, but there was time for some signing downstairs. At first I wondered why so many fans went to the toilet instead, until I realised the signing queue went down to that level and then round and up the other stairs, and initially back outside as well. I chatted briefly to a friend before going in search of Dodo and Son for some tea. When we’d failed to get into our first two choices of café, and walked back behind the lecture theatre, the queue was still going strong. I’d say that was one successful event. Even if it was in March. They come in waves, don’t they? ‘What if I say Beverley Naidoo?’ I asked. I had been talking YA authors with someone; someone who had only started reading YA not very long ago. And I wasn’t thinking, so mentioned Celia Rees and was met by a blank stare. It’s understandable. If you are recommended books to try right now, it will be the most talked about books and authors, plus some olden goldies like Philip Pullman and David Almond. Names ‘everyone’ has heard of. Whereas when I began reading current YA novels 20 or 25 years ago, there was no Meg Rosoff or Keren David or Angie Thomas. At the time Celia Rees and Beverley Naidoo were the reigning queens to me, along with Gillian Cross and Anne Cassidy. Adèle Geras and Mary Hoffman and Linda Newbery. Anne Fine. Malorie Blackman. No matter how many I list here, I will forget someone really important. Most of them still write and publish, but perhaps not as frequently as before. There’s the group of authors who appeared when Bookwitch [the blog] was in her infancy, with 2010 being a particularly fruitful year. Candy Gourlay and Keren David, followed by Teri Terry and Kathryn Evans. Again, I will have left someone out. And now, those ladies have many books under their belts, and there is a new wave of YA authors. I mentioned Angie Thomas, because she’s brand new, both in the book world, and to me. She’s also American, which seems to be where things are happening now. When I reviewed Celia’s latest novel, I compared it to Truth or Dare, and her reaction to that was that I’m probably the only person who’s been around long enough to have read both it, and the new book. This struck me as silly, as surely everyone would have read Truth or Dare. Wouldn’t they? Well, they haven’t, and it’s not lack of dedication, or anything. Most YA readers don’t last a couple of decades. Real, young people, grow up, and move on to other stuff. And if you’re already ‘old’ and catching up, you can’t read everything. But when I first met Beverley Naidoo, I almost curtsied. The Hate U Give by Angie Thomas has been on all the lists, including, strangely enough, IKEA’s. I was aware of the book. Well, you can’t help being aware, but somehow felt it might not be for me. 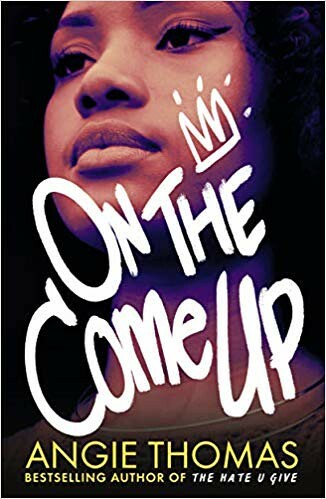 So when I wanted to read something by Angie, I decided to go straight to her second novel, On the Come Up. I’m not sure I know exactly what that means, but it doesn’t matter because it is Absolutely Fantastic. Bri is 16 and wants to be a rapper. She and her brother live in poverty with their unemployed mother Jay, who must be one of the greatest fictional mothers ever! I’m not sure whether the story is set somewhere real, or made up, but it feels very true. Bri and a few of her black friends are bussed out to a white school, where their parents hope for a future for their children, and the school hopes for more funds for taking them. It’s a school where the guards on the door unfairly target the black students. 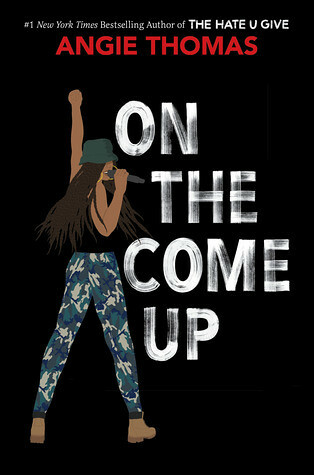 Bri’s dead father was a famous rapper and she wants to be like him, except more like herself. It’s a hard world, and a dangerous one; white police on one side and enemy gangs on the other. Drugs. Violence. Now, I know virtually nothing about rapping; what makes it good, or even why you do what you do. I’m old and white and I don’t get it. But I love this book. I’d have liked a soundtrack, just to keep me in there with Bri and her friends, and her drug dealing aunt and the neighbourhood children. Yes, I know. I sound like some idiotic old white Witch. But this is one great book, with characters you’d like to meet. Read it, even if you are a bit old.